These words are from Rosalie Bertell, Ph.D., of Toronto, Canada, founder of the International Institute of Concern for Public Health. 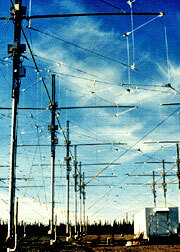 Dr. Bertell was commenting on a U. S. military experiment named HAARP (High Frequency Active Auroral Research Program). HAARP may be the test run for a ground-based ‘Star Wars’ defense system. Military documents say it is intended to disrupt portions of the ionosphere (electrically active layer above the upper atmosphere) by heating it with powerful pulsed radio frequency beams. Radiation that bounces back to the surface of the planet would be in the long-wave ELF (extremely low frequency) range. Intended to be the most powerful ionospheric heater ever built, HAARP’s ground-based apparatus – an array of 48 antennae each powered by its own transmitter – sits in the remote Alaskan wilderness northeast of the city of Anchorage. HAARP is much more than the auroral (Northern Lights) and radio-communications research project as is claimed by researchers at the University of Alaska’s Geophysical Institute and their financial backers – the U.S. Navy and U.S. Air Force. Any weapons system in its early stages can be easily disguised as “pure” research. The fact is however, that HAARP is a military experiment aimed at invasively manipulating the ionosphere by beaming high energy upward from the ground. Such activity could potentially disrupt natural systems on the earth and high above it. The ionosphere seems very far away, but even when undisturbed by humans it affects our everyday lives. For example, radio broadcasts are bounced off this electrically charged layer which lies between forty and six hundred miles above the surface of the earth, just above the ozone layer. The ionosphere is alive with electrical activity, so much so that its processes are “non-linear”. This means that the ionosphere is dynamic, and its reactions to experiments are unpredictable. The concept of non-linear is important in understanding the concerns of independent scientists who are knowledgeable about advanced physics and who warn against brash high-energy experiments on the ionosphere. Non-linear processes can change suddenly and unexpectedly, or they can increase in power dramatically. Some theorists such as Zielinski say that a non-linear process can under certain conditions tap into the background energy of space, which is also called “zero-point fluctuations of the vacuum”. Studying radio communications by using a tool as powerful as HAARP is a worthy scientific task in the opinion of the authors, but some independent researchers question whether the means justifies the end. Is it wise to poke holes in Earth’s electrical umbrella? Is it wise to prod a dynamic natural system without knowing how it might react? HAARP is intended to heat and lift a portion of the ionosphere above a selected location or locations on the planet in order to make a huge invisible “mirror” for bouncing electromagnetic radiation back to the surface of Earth. Why? How can a lay person understand what such a tool could do? Alaska state legislators are not necessarily trained in science, so in the spring of 1996 their State Affairs committee called in representatives of both sides of the HAARP controversy. One of the experts who testified at the State Affairs Committee hearing was Richard Williams of Princeton, New Jersey. He has a doctorate degree in physical chemistry from Harvard University and worked for 30 years as an industrial scientist in solid state electronics, electronics, structure of clouds, water evaporation and other environmental problems. Dr. Williams is an independent scientist; he’s not dependent on funding from the military. “I want to alert the legislature to an activity now going on in Alaska that, in addition to any local effect, might become a global threat to the atmosphere. That is HAARP. The initial experiment, as Mr. (project manager John) Hecksher said, will be done using modest power levels and are not a cause for concern. However, the project’s internal documents indicate that plans include the eventual use of power levels up to ten billion watts. Dr. Williams told the committee that he is a supporter of the armed forces, but as a scientist he wanted to explain how “unintended consequences of innocent and beneficial human activities can cause serious changes on a global scale”. We introduced two examples of activities earlier this century which caused unintentional and serious changes in the atmosphere, with effects worldwide. The first example he cited was the growing concentration of carbon dioxide in the atmosphere. The second unintended change that he cited is damage to the ozone layer, that shields us from harmful ultraviolet radiation. “But this was just one injection of energy,” Dr. Williams said. Those were changes of the atmosphere on a global scale, Dr. Williams noted. He pondered the possibility of additional, special, effects for polar regions, where the upper atmosphere has unique properties. Showers of charged particles coming from storms on the sun veer toward the poles, where they enter the atmosphere and produce the northern lights; some changes in the ozone layer have been most extreme over Antarctica and the far North. Dr. William Gordon (Ph.D. at Rice University, an electrical engineer specializing in radio communications) has worked on an ionospheric heater project and said there is “no convincing evidence” that exposure to low frequency electric or magnetic fields causes monitorable health hazards. He said the U.S. Navy has sponsored a series of studies asking if their ELF transmitters in the states of Wisconsin and Michigan have caused harm. While testifying at the legislative hearing he claimed that operation of very powerful transmitters have no adverse health effects. Dr. Patrick Flanagan of Arizona disagrees. Dr. Flanagan also gave telephoned testimony. He has a doctorate in both medicine and physics and has experience in government weapons projects: he developed and sold a guided missile detector to the U.S. military when still a youth. Later he developed an electronic device for communication with the brain. Dr. Flanagan worked with a Pentagon think tank that was run by the former head of the Office of Scientific Research. He also developed speech encoding systems. He has worked for NASA, Tufts University, the Office of Naval Research, and at the Aberdeen Proving Grounds for the Department of Unconventional Weapons and Warfare. Possible effects of future HAARP fields on living systems is a concern that should be discussed, Dr. Flanagan told the committee. Dr. Flanagan in his brief testimony cited a study by a researcher at Catholic University which showed that coherent ELF fields, which is what HAARP will generate, can have an effect on DNA. For example they create abnormal development in chicken embryos and “possibly in humans”. In reply to denial by a military representative, Dr. Flanagan said there are thousands of papers written by reputable scientists on the negative effects of ELF fields on living systems. The Environmental Protection Agency released a report in 1991 linking electromagnetic fields to leukemia and brain cancer in children, for example. Mark Farmer, a journalist from Juneau, Alaska, also testified. Farmer prefaced his testimony by reminding the military representatives that he quotes statements from their own documents. Farmer’s articles have been published in the prestigious defense magazine, Jane’s Defense Weekly, and in Popular Science magazine. “There is no supranational treaty that deals with the upper atmosphere or the ionosphere like there is for Antarctica or outer space,” Farmer continued. Farmer noted that Phillips laboratory, where HAARP’s project manager is based, does basic research, as does the Office of Naval Research. But they also build secret weapons. HAARP technology could be used for beneficial purposes, Farmer said. However, if people outside the military lose interest in asking that HAARP’s power levels and purposes be monitored by independent science councils, then the hidden world of defense corporations will probably step in. One of the legislators, Representative Green, asked if HAARP is opening a “Pandora’s box” – other countries would soon have whatever technology is developed in HAARP. Could what begins in its simplistic form, safe and controllable, later be used as a weapon by increasing the level of energy, and possibly detrimental effects, over selected areas? Edward Kennedy, from Naval Research Laboratory in Washington, D.C., who is a technical interface between the contractor for HAARP (Raytheon Corporation) and the government, said that is difficult to answer. However, he said, most other countries probably would not be able to finance building such a powerful instrument. Dr. Begich wanted the discussion to focus on the unique features of HAARP technology, not merely on power levels transmitted from the ground. The significant feature which distinguishes HAARP from other ionospheric heater projects operating around the world is the focusing capability of this particular design. The ability to focus radio-frequency energy into a narrow beam and to steer that beam gives it a powerful advantage in “perturbing the ionosphere”. Alaska may acquire a defense shield in the form of an advanced HAARP-type technology, Dr. Begich noted. Has the military decided to downsize this current program they call HAARP because of public attention to it? At the legislative hearing, a representative of the military said the current developmental prototype of HAARP is capable of 3.6 kilowatts of radiated power. The full scale prototype will provide up to ten times that, or about 3,600 kilowatts, he said. What do the military planners have in mind? Technical Memorandum 195, an unpublished 613-page compilation concerning the HAARP Workshop on Ionospheric Heating Diagnostics, (held in 1991 at Hanscom Air Force Base, Massachusetts) includes this piece of information: the desired level of power for HAARP is 100 billion watts, vastly greater than what the military is now claiming as a goal. Other documents from the military were openly published and refer to power levels between one and ten gigawatts (billion watts). Whatever the eventual power level it does not take much power bouncing back to the surface of the earth to affect living organisms. Dr. Nick Begich also told the State Affairs Committee about a substantial amount of science literature on the topic that has been published as recently as the early 1990s. The findings suggest that lower levels of energy (lower than previously believed) can affect human physiology. These studies are the most significant aspect of what has not been properly disclosed by those responsible for the HAARP project’s safety, he testified. The project began when the debate over effects of ionizing and non-ionizing radiation was still in its infancy. Since then, many scientists have come to the conclusion that lower energy densities, when pulsed in the right frequency range, will have profound health effects. Ground-Based ‘Star Wars’ – Disaster Or ‘Pure’ Research? This entry was posted in HAARP and tagged DARPA, HAARP, Nick Begich, Owning the Weather, Star Wars, Weather Modification, Weather War. Bookmark the permalink.